Metro commissioned artist Shinique Smith. Image courtesy of Eric Wolfe. Meet artist Shinique Smith as her collage artwork titled “Majestic Heights” is fabricated for Martin Luther King Jr. Station. High resolution scans and scaled match prints of Smith’s mixed media collage which include fabrics, printed matter, calligraphy and reflective fragments are being translated into glass mosaic artwork panels by skilled artisans who specialize in working with professional artists. The artwork will be installed in a highly visible place for transit riders passing through Martin Luther King Jr. Station to enjoy. Smith is thoroughly involved in the process to ensure that the hand-set glass mosaic is an accurate translation of her original artwork. Detail of artwork design courtesy of Shinique Smith. Majestic Heights lyrically weaves together the cultural richness of the community in visual punctuations pulled from fashion and pop culture. 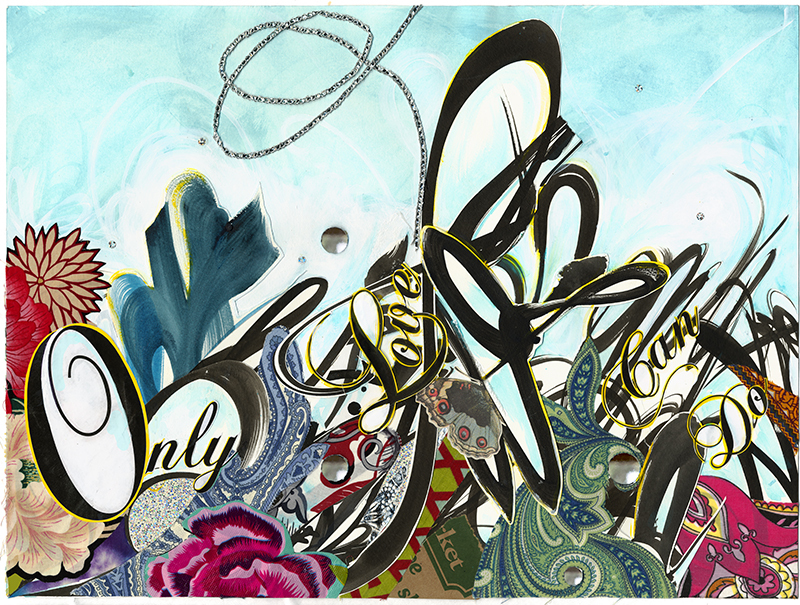 Calligraphy lines bring together words from speeches by Dr. Martin Luther King Jr., as they are abstracted and transformed within her beautiful undulating composition influenced by the rhythm and movements of daily life. Reflective, mirror-like slivers within the mosaic will bring the movements and reflections of viewers into the piece to create a lively, ever-changing artwork. Original artwork design by Shinique Smith. Glass mosaic is a highly durable material often used in transit environments all over the world. Mosaic as an art form has been traced back as far as the fourth millennium B.C. to the Temple of Uruk in Mesopotamia and the ancient Greek city of Pella. They were also found in Pre-Columbian cultures, which decorated objects using shells, mother-of-pearl and semi-precious stones. 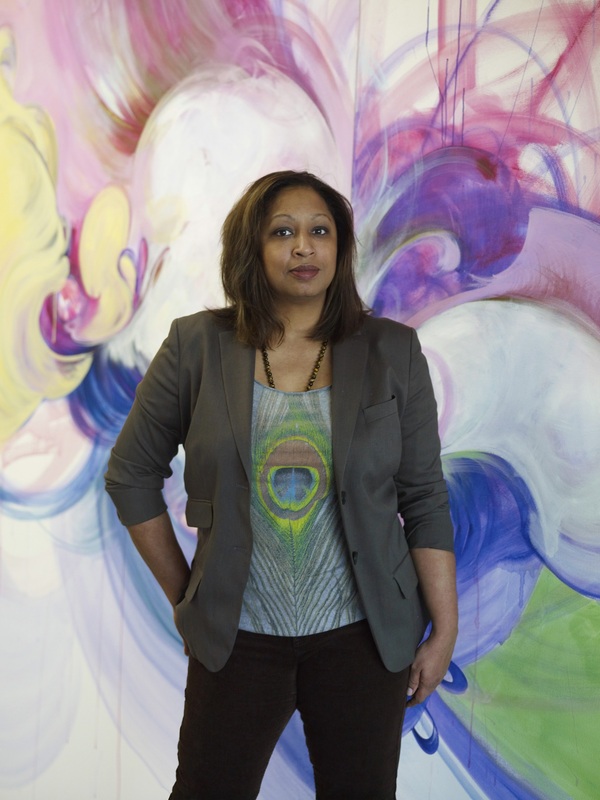 About the Artist: Shinique Smith received both her BFA (1992) and MFA (2003) from the Maryland Institute College of Art, as well as an MAT (2000) from Tufts University. She has had solo exhibitions at the Museum of Fine Arts Boston, the First Center for the Visual Arts: Nashville, the Studio Museum in Harlem, the Eli and Edythe Broad Art Museum at Michigan State University, and the Los Angeles County Museum of Art. Smith’s artworks are in numerous private and public collections, including the Los Angeles County Museum of Art and the Whitney Museum of American Art. Click here for more information about the artist. This article is part of a behind-the-scenes series exploring the artwork fabrication process for each of the eight new Metro Rail Stations under construction along the upcoming Crenshaw/LAX Line. The artworks will create a welcoming environment for future riders while connecting stations to surrounding neighborhoods. Click here for more information about the Crenshaw/LAX Art Program. that’s going to look amazing!